So you wish to find and buy a special Koi? In terms of land mass, ‘Ye Olde Worlde Yamakoshimura’ (now, sadly no more in name) and its immediate surrounds is not large by any means and one can easily drive around the entire perimeter of the area in less than 75 minutes. 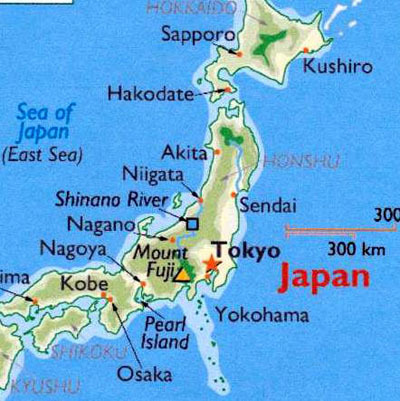 Yamakoshi is in Niigata Prefecture some 200km north west of Tokyo as shown in the large scale map and is situated centrally to the north of Nagaoka and Ojiya Cities. The much earlier name of ‘Nijimura’ referred to twenty small villages that were contained within the boundaries and the majority of these villages are still there today. 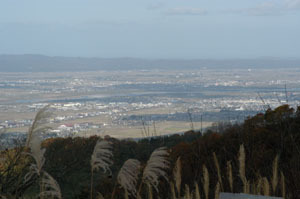 The geography of the area varies between the flatter aspects of Uragara and Iwamagi right through to the lovely hill villages of Shiyodani, Koguriyama, Takezawa, Mushigame and Yomogihira. 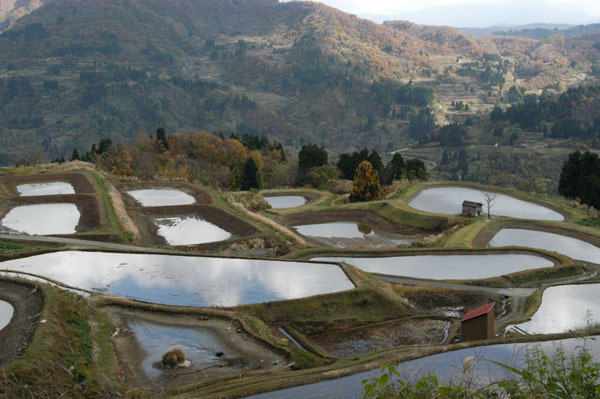 However, this region does contain the densest population of quality Nishikigoi breeders anywhere in the world today. If all these breeders were condensed into a single entity (such as a modern-day retail complex) then it is easily also the largest ‘Nishikigoi Outlet’ in the world. In view of this, it is the only real part of the world where serious Nishikigoi enthusiasts can visit, at the appropriate times of the year, and view the widest range of Koi quantities, varieties and qualities available anywhere on this planet. As an added attraction it is also one of the most beautiful areas in the world that the locals continue to try and keep it as it has been for Centuries despite many man-made innovations and attempts at ‘modernisation’. 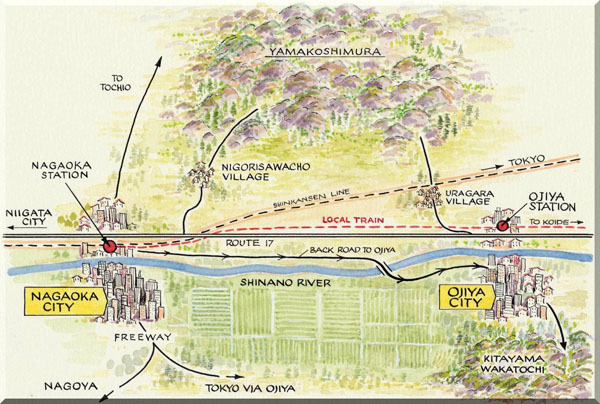 This illustration gives an idea of your immediate surroundings and how to access Yamakoshi, whether you decide to make your base in either Nagaoka or Ojiya cities. 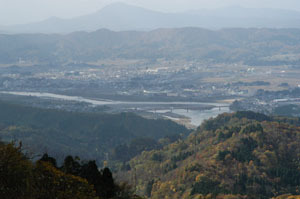 These photographs show the views from Yamakoshi down towards Ojiya on the left and Nagaoka to the right and have been taken from a road closed in winter months that leads to Mushigame village from Koguriyama village. For overseas visitors to the area, the associated travel, accommodation and reasonable daily living expenses have to be seriously considered beforehand whether one is looking for one or two special additions to one’s existing collection or for an overseas Nishikigoi dealer to source a wide range of sizes, quantities and varieties for re-sale back home. Whatever the actual purchase budgets may be, the total ‘base’ expense can vary today from £1,600.00 to £2,800.00 (depending on current exchange rate) for the usual seven to ten day trip. Obviously, if one is merely wishing to purchase inexpensive Nishikigoi then it is significantly far cheaper to source them in one’s own country after all costs for a visit and shipping/importation risks and costs back home have been considered and are, naturally, reflected in the overall retail price when offered for re-sale back home. As to the times of any given year to make a visit, one must first bear in mind that Nishikigoi production is ‘farming’ in its truest sense. Seeds (fry) are planted (produced) in spring and grown throughout the summer months in outdoor field ponds before they are harvested in autumn. 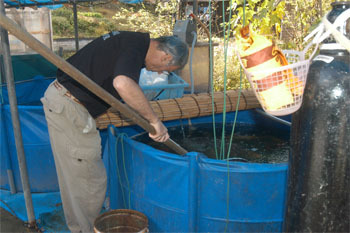 This period, in respect of Nishikigoi farming, is from May/June up to October/November after which the stocks are housed in indoor, heated, concrete, re-circulating filter systems for their vital protection against harsh, outdoor ambient temperatures which are prevalent there from late November to late April. In view of this, it should be obvious that, immediately after the autumn harvests have been made, this is the very best time of the year to visit the area and find a wide range of all sizes and ages of Nishikigoi on offer. This is with the exception of those born only a few months earlier and are not yet really strong enough or large enough to make the long export journey overseas. This picture shows the field ponds partially drained after the autumn harvests have been completed. These stocks, (tosai or Koi born in June of the same year) will be kept in indoor, heated systems and fed daily until the following spring when the last selection of many prior selections will be made to finally determine the breeder’s ‘tategoi’ (Koi that the breeder considers to have some potential to improve in both size and value by another season of growing in the field ponds) versus the ‘tateshita’ (those not considered worthy of further valuable growing space). Therefore if it is this size/age of Koi one is looking for, then April to early May is the best month possible to make a visit. For all other times of the year, with the exception of these two slots, it is futile to plan a trip to the area in order to purchase stocks. Even now, some enthusiasts believe that one only has to fly to Narita airport near Tokyo, exit the airport environs and gaze at pond after pond of wonderful Koi for sale at any time of the year, alas this is definitely not so. In truth there are many Japanese people today who have never even heard of Nishikigoi. Late November to January produces a much narrower choice, after most of the best stocks of the last harvests have been sold, and also weather conditions can be truly miserable and sometimes impassable. 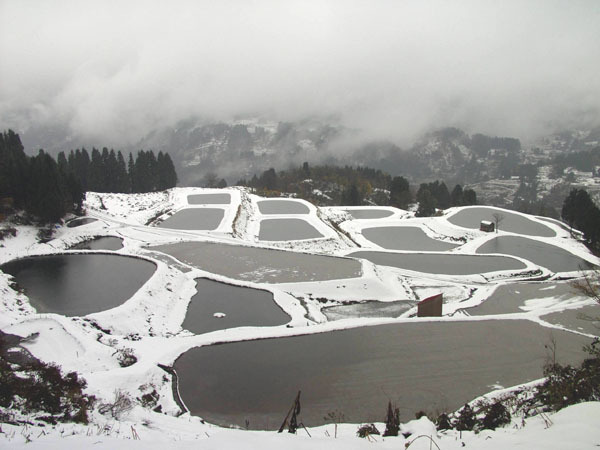 This shows the field ponds in winter, empty of Koi stocks from early October until early June. Whilst from late May to late September the vast majority of stocks are housed in the field ponds (doro-ike). Once these two time periods have been noted then all one needs is money to purchase the Koi, a safe method of transportation back home and then the most vital factor of…………… ‘knowing exactly what one is looking at’! Whilst the money and transportation aspects will be readily available for many, the latter can only be gained by significant experience of actually purchasing many Nishikigoi on countless previous visits. I assure you, this is not a rapid ‘learning curve’ by any means. For those visitors simply wishing to find one or two special Koi from the thousands available this is not so difficult as the oft-quoted cop-out of ‘Beauty is in the Eye of the Beholder’ always comes to the rescue here as does ‘If YOU like it – then buy it’ phrase. However, to those who know the truth of these statements it is not the best form of simplistic advice to take in when actually spending one’s own money. In truth, for any Koi enthusiast/dealer to even be able to get anywhere near this stage, one can actually live in this hallowed area for years and visit the farms on a daily basis to inspect the stocks for days or even years on end. However, and this is the ‘crunch’, unless many hundreds of Koi have actually been, on previous occasions, individually and seriously selected, paid for, shipped and offered for re-sale (which is then the only time when one’s own ability is really put to the final test) then the ‘just looking experience’ is just that and nothing more whereby good pictures would provide a far less-expensive compromise but a compromise nonetheless. The actual proof of success or failure can only really be determined if these Koi prove to produce a worthy sales profit. This can also come to fruition in later months when the ‘worth of the eye of the buyer’ can be proven and recorded, by some Koi going on to take worthy awards at worthy Koi shows. In a nutshell, it is the thousands of previous bad or ‘less-good’ judgements made from actually buying and paying for Nishikigoi with one’s own hard-earned money that eventually produces this rare ability which can never possibly be ‘taught’ except by hard experience. ‘Love and enthusiasm’ alone is not nearly enough to achieve this proven and rare ability although it is another vital part of the whole. Again, whilst ones ‘eye’ may improve significantly by gazing at actual stocks over many daily/annual visits, the actual proof of the ‘value of the eye’ can only be realised in actual purchase by way of these Koi going on to take show awards or realising a final and vital profit on re-sale. Another point to bear in mind here is very important, if one is visiting Yamakoshi today, even at the best possible time of the year namely October to November, a mere ten to fourteen days of intense searching, to find and buy special Nishikigoi, either to collect as additions for your pond or for re-sale at dealer premises, is nowhere near long enough. In order to be able to scour the villages and the breeder’s outlets and make all the countless, yet vital, return visits to find special Koi – one must really be prepared to stay there for the entire two months. If only four weeks are available then I would suggest the arrival should be commenced around the 18th. October. As to spring visits for tosai, the whole of April is the most productive yet far more difficult and often exasperating to find suitable stocks than it is in autumn. I would suggest a start date for a two week visit should be around the 14th April in order to escape the dreaded ‘Golden Week’ when Japan seems to grind to a complete halt. Remember also that there are many breeders in the area ranging from very small producers right through to the famous names and at all stages in-between. In my experiences it is foolish to leave out any of these outlets when searching for stocks. I cannot begin to recall the number of superb, ‘never-to-be-repeated one-off Koi’ I have found and bought by pure chance at many tiny and visually unlikely outlets – admittedly most can be a waste of time and money but the rare successes I have experienced over the years have more than compensated my efforts and expense. There is also a very efficient ‘jungle telegraph’ that travels around the mountainsides at an alarming speed. I forget the number of times I have visited a tiny out-of-the-way breeder to be told ‘Oh, Mr. Peter, I heard you have bought a wonderful and very expensive Sanke from ********* yesterday, I hope it brings you luck’. It’s quite amazing how the information is passed around. My good friend and a superb ‘eye’, Dennis Wordsworth, always on the lookout for something special. Picture taken at the Oya outlet in Yamanaka village in 2004. Before I get down to actual buying details to highlight basic requirements and the vast differences between spring and autumn visits, it is better if I attempt to point out some pricing details of Nishikigoi which have often produced many questions from many enthusiasts. The Japanese breeders do not have trade prices, wholesale prices or broker prices for their stocks they simply have one price for one Koi and this price does not only vary on a daily basis (which it often does and on many occasions) it can also vary quite significantly in respect of the actual person who is asking for the price. In simplistic terms, the breeder attempts to get the best price possible for his production but he would be foolish not to consider reductions by way of quantity purchases or a proven, previous track record or reputation of the buyer in question who is actually making the price enquiry. This can be extremely annoying for the newer visitors who somehow believe that getting on a plane and making the pilgrimage to the area gives them some ‘right’ of passage to step right in and get the very best possible prices. Sadly this is so far from the truth because, as in many similar situations in life, one has first to ‘pay one’s dues’ – in the case of Nishikigoi this involves many years of return visits and purchases at the significant travel and living costs involved. For myself, there were a few situations that helped me tremendously in the early days to learn just some of the ropes involved in buying stocks. Especially in the complete understanding of all Japanese ‘Koi monetary terms’ by ear and the need to be able to evaluate the potential value of many Koi in a matter of only few seconds. 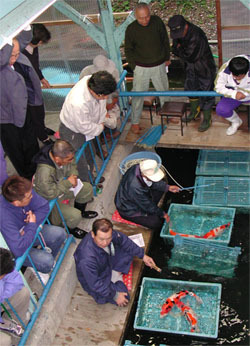 This came by way of having to attend both large and small Koi auctions held at sites in all parts of Japan, in order to purchase Koi at times when most stocks were growing in the field ponds – exactly the same period commonly referred to in the UK as ‘the Koi season’ and when demand was very high. In those days they were regularly held in Niigata; Saitama; Shizuoka, Isawa; Nagoya; Hiroshima; Himeji and several other areas where it was necessary for me to spend from early April to early December in order to combine these with my spring and autumn visits. Sadly, since the onset of viral diseases first publicly experienced in Japan around 2002, these events are almost a thing of the past. The few remaining sites still holding rare auctions today pass the ‘lots’ through the sales area in individually-inflated vinyl bags to ensure that there is no common water shared by any of the other entries. As a result, the experience has been so diluted it is almost worthless. Whilst it was the common consensus of opinions, voiced by many of those (who have had no practical experiences of these events at all), in that they were only held ‘for the disposal of junk and low-grade Koi’. These hopelessly incorrect opinions need to be exposed as there were several auctions held with a starting point of 1,000,000yen for a single Koi (today’s value around £7,000.00). There were also countless other auctions with minimum starting bids of £1,000.00 and many that attended and purchased Koi were some of the most prominent Nishikigoi breeders in Japan. At these events I was painfully aware that I was in the company of the best ‘eyes’ in the world. Also, the vast majority of the Koi sold through these high-class auctions several years ago could easily take major awards in modern-day UK Koi shows especially as far fewer high-quality stocks are now imported for re-sale. Once again, I was lucky in being there at the time to learn to have to view Koi and be able to make a snap decision as ‘to bid or not to bid’. This was because most of the auctions could have over 500 lots going through and it was rare that one lot ever took longer than 15 to 20 seconds from first glimpse to final sale. Needless to say, I made countless mistakes in some purchases but, thankfully, I also learned from them – albeit after the event. These ‘clangers’ of mine ranged from a superb ‘One-Eyed Goshiki’, a truly superb Shiro Utsuri, with a beautiful maruten beni pattern – cleverly concealed below the jaw; a wonderful Kumonryu that would not stay still in the basket purely to disguise a slight but obvious kink in the body plus many other fin and mouth irregularities far too many to mention. All in all and on reflection, I made countless more successful and profitable purchases than the multiple bad judgements and also learned and understood the dialects of each and every auctioneer, which was extremely important and these varied from area to area. It was often a sobering thought for me in realising that all of these purchases were made with only two significant and constant reminders that it was my own eyes only that used to make these snap evaluations and then my own money with which to pay for them! In short, I was thrown in at the deep end without a paddle. I openly admit that these events were extremely valuable for me and stood me in good stead when viewing and purchasing Koi from the breeders themselves on many other visits.